As part of the FAIR EU project, the European Citizen Action Service (ECAS) is currently looking for 6 legal experts in the field of free movement and political rights based in the following countries: Belgium, France, Greece, Ireland, Portugal and Luxembourg. Their main task will be to organize focus groups (one per country) in order to identify and analyse the links between obstacles to free movement and the exercise of political rights. Develop the final report from the focus groups, including a summary of the discussions and main conclusions regarding the links between the obstacles to freedom of movement and political participation. The report must be developed in English and in the language of the country where the focus group took place. The offer for organization of each focus group can be priced up to €1,272 VAT included. Additional resources will be provided for the logistical organisation of the event (room rental, catering). 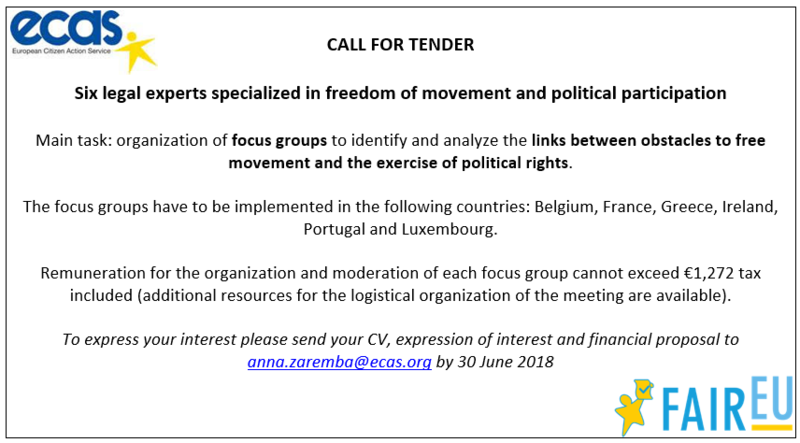 To express your interest please send your CV, expression of interest and financial proposal to anna.zaremba@ecas.org by 30 June 2018. For more information, please see the full terms of reference. FAIR EU is a project co-funded by the Rights, Equality and Citizenship Programme (2014-2020) of the European Union, the consortium of which is coordinated by ECAS and composed of the following partners: Migration Policy Group (MPG), European Association for Local Democracy (ALDA), the European University Institute (EUI) and Malmo University. The aim of the project is to foster the successful inclusion of EU mobile citizens in their host EU country’s civic and political life through the provision of a holistic approach to tackling obstacles they face when exercising their rights. From the VoteBrussels campaign to crowdsourcing citizens’ opinions! #JoinTheCrowd – A story of the VoteBrussels campaign and the launch of FAIR EU crowdsourcing! Project Co-funded by the RIGHTS, EQUALITY AND CITIZENSHIP PROGRAMME (2014-2020) OF THE EUROPEAN UNION.